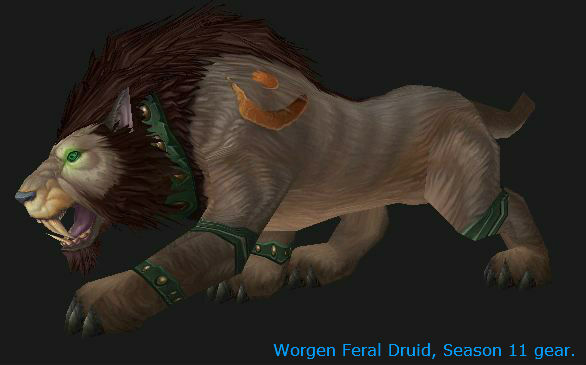 Warlords of Dreanor brings a lot of changes to Feral and to Druids in general (especially Resto and Balance.) To see all of the changes just check out our WoD Druids post. This page covers the Feral Druid, Cat form, in PvP. If you are looking for info on raiding see our PvE Feral page. 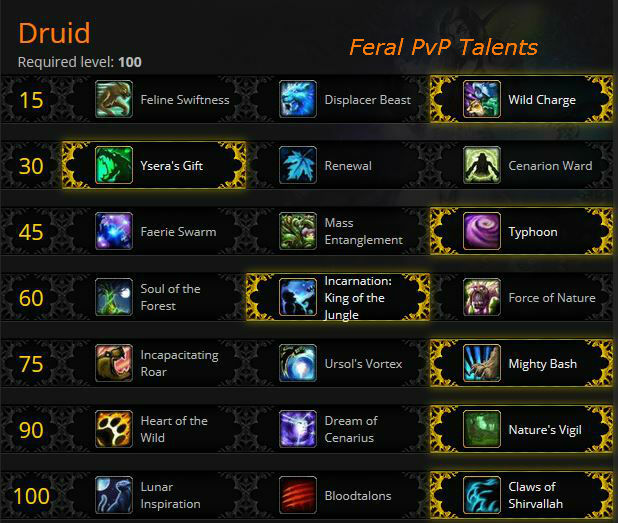 Our druid leveling page is here. PvP stats might differ from PvE stats due to a greater need for burst: putting down a lot of damage very quickly. In Warlords your Hit, Expertise, PvP Power, and Resilience stats are dead. Reforging is dead. You have two new stats, Versatility and Multistrike. You also have an attuned stat, via your level 90 Sharpened Claws ability, which gives you +5% Crit from all sources. Weapon: Two handed Agility weapons are your best damage add. Agility is way better than any other stat, regardless of gear and talent pick. Critical hits do 150% damage (200% in PvE.) You have a base 15% as a baby feral and another 5% at level 90 from your Sharpened Claws ability. After Ag., Crit is clearly your best stat, even with the PvP nerf, party because it also procs additional Combo Points from your Rake and Shred abilities (Primal Fury) and also party because melee crits heal you for 3% (Leader of the Pack.) Your Crit chance, with your Ferocious Bite, is doubled Vs bleeding targets. Shred’s Crit chance is doubled if stealthed. Versatility gives you a % bonus to your damage and heals and half that for your damage reduction. Mastery is a nice improvement to our bleeds, but are bleeds are a bit weak in Warlords, making this a less important stat. Your 4 piece set bonus increases your bleed damage somewhat, making Mastery a bit more important. Any other buff or effect that improves your bleeds will also increase the value of your Mastery. Haste speeds up everything you do, including cooldowns, spell casting, how fast your bleeds tick, and so on. Talents can be changed, one at a time, on the fly, just like glyphs. All you need is one Tome of the Clear Mind, from your reagents or Inscription Supplies vendor. Naturally your trainer can clear the whole list. See below for explanations. The above picks are checkmarked . Feline Swiftness – This is an all-purpose movement increase, but doesn’t add any form of charge or burst. It’s a passive ability and about it’s only value is that you have one less button on your bars. Displacer Beast – Much like the mage spell Blink, this just moves you forward, shifts you to cat form, and speeds you up for a few seconds. you. It might have its uses, especially as an escape, but Wild Charge is superior if you’re planning to attack. DB is not Vanish and it doesn’t remove effects or aggro. Nice for travelling, escaping, and flag carrying, though. Wild Charge – In Cat Form, WC works while prowling, puts you behind a target up to 25 yards away, dazes it, but does not activate any of your attacks, does not break prowl, and does not add any special buffs. Unlike the Rogue’s Shadowstep. WC can only be used on hostile targets. It does set you up nicely for your opener and makes it easier to stick to your target. Switch to Bear and your Wild Charge will immobilize (root) your opponent, which is a nice peel. In caster form you can blip over to an ally who needs your help or just your company. Ysera’s Gift – a pretty decent passive heal. If you’re 100% then the heal will hit an ally. Almost as good as Cenarian Ward and it’s passive. Nice for long lasting fights. Renewal – Insta-heal usable in any form. Nice for those situations, but not as versatile as Nature’s Swiftness and a long cooldown. Cenarion Ward – Protect someone else? What? Who would ever do that??? Gives you (or an ally) a nice heal when you need one. Much faster cooldown than Renewal and a better heal. Doesn’t seem to scale well with better gear. Faerie Swarm – Slows and prevents restealth for the duration. Great for fighting stealthies, though the other two have definite use in crowd situations, eg: Battlegrounds or World PvP. Mass Entanglement – The good ol’ entanglement spell, now usable on the masses. Also usable in any form. Great for those time when you’re dealing with runners, but has a 2 min cooldown. Only lasts a few seconds in PvP, not 20. Typhoon – Great for a boomkin, not so bad for you either and it has situational brilliance. Nice for getting out of (or breaking up) crowds or the flag point in Eye of the Storm or on cliffs. It’s even be fun when cast on a boat. it can also be used to knock opponents away from you or your partners and interrupt casting. Knock people down for kiting purposes, knock people away from their allies, etc. Someone’s pressuring you too much? Knock him/them back. Soul of the Forest – Faster energy return is always nice. Passive. Better in PvE than PvP. Incarnation – Very nice burst talent. 30 seconds of Prowl and Rake goodness. Force of Nature – Summons a treent to fight for you. Incarnation is more useful and has the potential for much greater burst. Incapacitating Roar – Nice for 3v3 and such, but Bash is better for most of the rest. Ursol’s Vortex – Basically a group Slow that keeps people from escaping the area. Nice for BGs, fairly useless for arena. Mighty Bash – Stuns are sweet. ’nuff said. Longish cooldown, though. Shares Diminishing Returns with all the other stuns. If you team has plenty of stuns then go Incapacitating roar. Heart of the Wild – Awesome for those times when you’ll be dropping out of cat form to perform other roles, such as healing. Works with your Cenarian ward talent. Dream of Cenarius – Boosts your Healing Touch and Rejuvenation by 20%. Casting those spells on an ally results in the same spell being cast on you, which is a nice 2 for 1. With Nature’s Vigil you can be doing damage, instead of using your heals. Nature’s Vigil – All of your damage abilities also heal you or an ally for 40% of the damage (or 30% of any heals you’re throwing.) 90 second cooldown. Lunar Inspiration: Moonfire is now usable while in Cat form, adds 1 combo point, and costs 30 energy. Bloodtalons: Casting Healing Touch causes your next two melee abilities to deal 30% additional damage. I can see this being of some interest… Heal yourself or someone else, then execute your burst on the enemy. Claws of Shirvallah: shapeshift into a creature half man and half cat. This alternate Cat Form allows the use of all non-damaging Druid spells while shapeshifted, and increases Versatility by 5% (which is a decent damage/defense add.) You don’t have to shift forms to cast things like Cyclone. In Warlords you will learn certain glyphs automatically, just as you do with your abilities. Theese glyphs will appear in your glyph list, but you will have to manually install them. Other glyphs can be had from the Auction House or a scribe, as always. Exclusive glyphs cannot be used with each other. As an example, the glyphs of Savagery and Savage roar, or Cat form and Ninth Life. Pick only one or each pair. Like talents, your glyphs can be swapped on the fly. One glyph swap costs one Tome of the Clear Mind and some situations might demand different glyphs. So carry a stack of Tomes at all times. Highly recommended: Glyph of the Ninth Life – 10% damage reduction in Cat form, exclusive with Glyph of Cat Form. Glyph of Savagery – Savage Roar is now passive, but is 10% less effective. Still is a pretty serious damage increase. Glyph of Maim – Do you Maim? If so then you might be interested in the +100% damage from the glyph. Glyph of Rake – adds 8 yards to the range on your Rake while prowling. Gives you enough range to hit a Hunter in his Flare. Makes Rake a lot easier to land vs dodgy opponents. Glyph of Dash – more Dashes, which is pretty nice. Glyph of Ferocious Bite for a small heal when biting. Glyph of Survival Instincts – more, but shorter, Survival Instincts. (now lasts 3 sec with 1.5 min cooldown.) Nice if you can time those big hits to the point where a 3 second SI works for you. Glyph of the Master Shapeshifter – Save on mana. Glyph of Cyclone – nice for the extra range to your Cyclone. Glyph of Faerie Fire – Nice for the extra range, especially if being kited by a Rogue or Feral. Pick whichever ones you like, they’re all pretty much just cosmetic, though Predator has some good uses. Glyph of grace is handy if youi tend to jump off of, or get knocked off of, high places. Glyph of Aquatic Form – faster swim speed, might have some escape value here and there. Dreanor and the BGs have enough water to make this worthwhile. Glyph of Travel – Your travel form is now as fast as a ground mount. Glyph of the Predator – Allows you to track other ferals. Glyph of the Stag – Give a buddy a lift. Glyph of One with Nature – Teleport to some random natural location, so no cities. Glyph of the Chameleon – Random hair color changes, for the punkers in the group. Glyph of the Cheetah – A cheetah is now your travel form, rather than a stag. You won’t be able to give your buddy a ride, either. There are no PvP gem sockets in Warlords at this time (going into patch 6.2.) If you’re level 90 or less or are using socketed PvE gear in your PvP, then read on, otherwise skip this section. In Mists of Pandaria the gems with secondary stats (ie: Crit) have twice the value of primary stats (eg: Agility.) However, Agility is definitely more than twice the value of Crit, etc., so your only real gem choices are Agility and more Agility. Socket bonuses should be for Ag or Crit, otherwise ignore them. Sockets have a (small) random chance to appear on Raid gear, so perhaps they’ll also appear on PvP gear someday. Also, there are no meta gems or sockets, there are no socket bonuses, and all sockets are “prismatic,” which means that they will take any available gem. If sockets appear, or if you’re using PvE gear, then gem for Crit. There are no head enchants and all shoulder enchants are provided by the Inscription profession. If you need more cash to be able to buy these things, gems, mounts, etc. then check our Tycoon review. Enchant Weapon – Mark of the Thunderlord: Sometimes procs 500 Crit for 6 seconds. There are similar “breath of…” enchants which add +30 to the stat and are much cheaper. Instant cast heals, roots, etc. Try to save your Wild Charge as a gap closer. Rip – Finishing strike, more CPs = more damage. About the most efficient way to do damage, if the fast will last that long. Thrash – strike all within 8 yards and add a bleed to each. Only has occasional use in the BGs, rare use elsewhere. Swipe – hits all nearby opponents, does 20% more if they’re bleeding. Only has occasional use in the BGs, rare use elsewhere. Ferocious Bite has higher crit chance vs bleeders. Burst damage, best for shorter fights. Savage Roar – keep this up at all times. You get an automatic 5 pt SR if you rake or shred from stealth. The glyph makes it passive, but drops the damage bonus to 30%, from 40. Rip – Bleed finisher. CPs increase the damage, not the duration. Ferocious Bite – big chomp. Best one shot damage ability that you have. Try to hit this with at least 50 energy pooled and all 5 CPs, for the most damage. Refreshes your rip if the target is 25% or less. Crit chance is doubled Vs bleeding targets. For low health targets you can use 1 CP, low energy Bites to refresh Rip. The glyph adds a small heal to the bite. Maim – each additional CP gives more damage and more duration to the stun. The damage isn’t really the important part, the stun is. . You can Maim your focus target or peel an attacker off your healer. Berserk – 15 seconds of mightiness. The perk adds 50 energy while Berserk. Tiger’s Fury – +60 energy and 15% damage buff. Nice energy management cooldown. Frenzied Regeneration – if you have to be in Bear form and you’re being trained hard. Entangling Roots wraps him up and roots him for a few seconds. Cyclone – one target is out of the fight for up to 6 seconds. Infected Wounds causes Shred and Mangle to slow the enemy. Skull Bash charges and whacks the opponent, interrupting his cast and locking out that school of spell (eg: nature) for 4 seconds. The glyph adds two seconds to the lockout. Stampeding Roar breaks the team from of roots and snares and increases speed. Survival Instincts reduces all damage taken for 6 seconds. Two charges greatly increases its utility. Bear Form is nice against melee cleaves. Prowl – Your stealth. The perk (Prowl) removes the movement speed penalty. Faerie Fire – Won’t allow the target to stealth. Hurricane for light area damage, but it’s best used if you suspect a stealthy is in the area. Mark of the Wild – this is a team buff and it can be dispelled, so make sure it’s actually up. Remove Corruption removes those annoying Rogue poisons, plus curses and hexes. Revive – for those times when you dont think your buddy should be lying around, doing nothing. Moonfire – useful for wasting that Warrior’s Spell Reflect. Leader of the Pack – increases party crit chance by 5% and your melee crits heal you for 3%. Stampeding Roar – works on nearby party members and breaks roots and snares. Cat form increases base speed. Healing Touch is nice, but takes too long to cast, usually. Rejuvenation is a nice heal over 12 seconds. This will be your main heal. The perk allows you to rejuv while in cat form. With the perk you can cast it from Bear form. Resource management: mana, energy, combo points. Mana isn’t going to be an issue unless you’re casting a lot of spells or shapeshifting a lot. The Master Shapeshifter glyph is handy if you shapeshift a lot. Energy is really your limiting resource. If it bottoms out then you can’t do much, if you cap it then you’re not using abilities enough. Slow down just a bit to keep the energy bar up with enough energy to do something. Your Tiger’s Fury (use every 30 sec, +60 Energy, +15% damage) can be a big help here. Slow or Root you: Shapeshift. See macros below. You might want the glyph (Master Shapeshifter) if you do this often. Stun/cyclone you: PvP escape trinket. Stun you twice: Damn. Fortunately diminishing returns will cut the time in half. Bleed you: Heal through it. This video covers talents, glyphs, macros, and more. There’s also a short rotation bit near the end. PvE gear in PvE? Just say no. Why? The PvP gear is generally much better. Any given piece of the gear has two ratings, one for PvE and one for PvP. The PvP part of that rating will be much better than the current raid gear. For example, Primal Combatant gear is 620/675. 620 is for PvE and 675 is for PvP. Now, PvE gear IS uprated to a higher level in instanced PvP (BGs, Arena,) but the PvP gear will usually be better. On the other hand high end PvE gear that matches the PvP rating of your PvP gear is, stats being equal, just as good. If it has a socket, or +speed or +avoidance or +leech then it’s better. There are three tiers of PvP gear that can be earned. The first number shown is the PvE rating, the second is the PvP rating. Clearly if you want to do both you will need two sets of gear and swap them with the equipment manager. With reforging dead you have to rely on correct gear selection. Every slot for both the honor and the conquest gear has two choices available, each with different secondary stats. Pick the one which is best for you. The Aspirant gear does not offer that choice. 2 piece Set: Interrupting a spell with Skull Bash resets the cooldown of Tiger’s Fury. 4 piece Set Feral: Shred critical strikes causes the target to take 10% increased damage from your bleed effects for 6 sec. The Conquest weapons require 7250 Conquest points earned over the current season before you can buy them. The Honor weapons do not. Consider buying the trinket pair first, for the 15% damage reduction from players. Honor: Buy the weapon first, then the larger pieces, due to those pieces having more stats. Rings, cloak, and neck items are next, since they can be enchanted. Before you’ve collected your PvP gear it might be worth getting the crafted gear. You are limited to three pieces. The armor is 640 and the weapons 630, and all can be upgraded by 45 points (75 in patch 6.2.) Hope you have a lot of gold or patience enough to gather the mats. If so, consider the legs and chest from leatherworking, and the staff from Inscription. A Volatile Crystal will reroll the stats on the weapon and a Leather Refurbishing Kit will do it for your armor. It might be cheaper to reroll the stats rather than find the item with the best stats. Look for Weapon Crystals to upgrade your stick and Burnished Essence for your weapons. Expect to pay a lot. You can use the following macro for any of your forms, one macro for each form. Using it will pop you immediately into that form. If you’re already in the form then using it will instantly pop you out and then right back in, instantly breaking snares and roots. A more interesting version of the previous macro is this one. It looks at which stance you’re in then pops you out and right back in, breaking snares and roots. 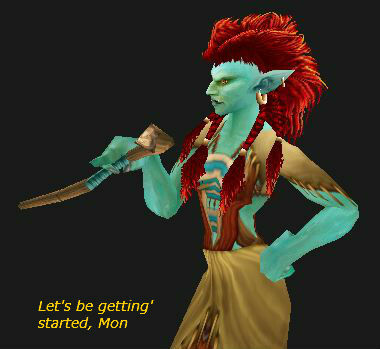 Once you’ve created your new Druid, or dusted off the older one, you’re looking at thousands of quests and a million mobs to grind the trip to 100 and that can be a bit daunting. Not to mention wondering where to go and what to do, especially if you picked up a few levels in the dungeons or PvP. And Warlords has a lot of quests. Dugi’s in-game Leveling Guide takes care of all the “looking up stuff.” No more switching from game to quest log, no more asking questions in chat or guild, no more browsing some website for tips. No more doubts or questions about what to do next. Dugi’s guide appears as an in-game window (very small and moveable) which tracks the quests you’re on, and the objectives (kill this, collect that.) It automatically updates as you complete tasks and quests and provides all of the “where to go and what to do” info that you will need to level quickly. Always updated for the latest patches and expansions, even for Warlords and beyond, Dugi’s will never be obsolete. Grab your copy here and get leveled fast.